Coastal fall mantel ideas and even though it may still be summer we are look ahead to inspire your seasonal planning. 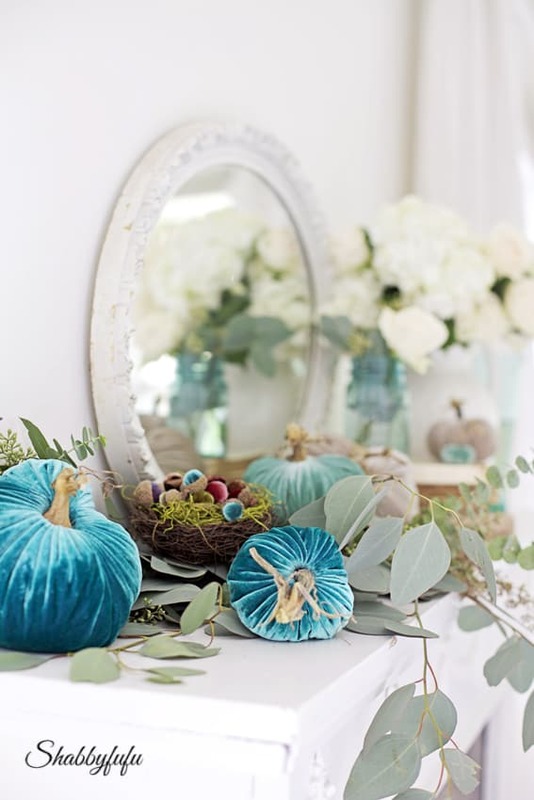 I wanted to share these exquisite silk velvet pumpkins and acorns that are perfect for a COASTAL look. They will just bring that amazing aqua autumn color to the fall decorations in your home and something really different! Aqua is the perfect color to bring the beach coastal look in and a color that you can truly use year round. Like on this mantel! You don’t need a mantel to style this way and can do a similar look on a shelf or bookcase and even create fall table decorations by piling the pumpkins on high. I showed you how to do that in THIS POST, one of the most popular around here! Let’s go through a little step by step to get you started! Clear the clutter…just like I always recommend when styling something new. After clearing the previous clutter I wiped down the mantel and added some silver tipped eucalyptus just tossed lengthwise across the mantel. Then I just began layering and you can see more of how I styled this look in the straight on photo below. Don’t just line things up…look at your angles and put some of the pumpkins sideways or prop against the wall or each-other. Watch for movement of color and use a variety of colors in your mix. Add in any additional accessories, and here I added some velvet acorns, old tattered books and some white roses. Notice how I used a vintage Mason jar to hold some roses and picked the color aqua back up in that? If you love a coastal look you can add in some of your treasures from the sea that you’ve collected over the summer months. How about some bleached white seashells or coral? What about mixing in some vintage bottles or inkwells that you find at a flea market in aqua colors? I’ve seen some nice reproduction bottles lately in the big discount stores that so pretty to collect. The velvet pumpkins are from Love Feast Shop and I’ll be sharing some more coastal fall mantel ideas soon, so watch for that. I can envision these on my beach farm table and they will make for a fabulous centerpiece. You can see that I don’t have a million gazillion velvet pumpkins here, but have filled in with a bird’s nest and everything else that I’ve mentioned. This is how you stretch your decorating dollar to go further…by filling in your main focal point with what you already own or can grab from the garden! Fall is my favorite season and I have so many great things planned to share with you coming up! Do you have a specific request? I’d love to hear from you via comments below and don’t forget that you can subscribe and never miss a post! I want those pumpkins and I live your blog. Oh there are those exquisite pumpkins again….I loved your velvet pumpkin vignette before and thought that it could not get any better, but you always knock these vignettes, mantelscapes and tablescapes out of the park…Would I love to win some gorgeous velvet pumpkins and acorns too?…you bet!….I love the aqua…so perfect for your home!…. I also liked LoveFeast Shop on Facebook! Love your decorations! Love Aqua! Hi Janet. I am in LOVE with the turquoise trio and the purple trio pumpkins. I have been following your blog for quite a while now and always anxious to see your next post. I'll trade you two of my children for those pumpkins. Fair trade I think.. but should I win the $100.00, I'll keep the kids and purchase the pumpkins! Love the beautiful velvet in the royal colors!! If I were to win I would buy the pumpkins and share (maybe) with a friend. I am in! I would know exactly what to do with the slate fruit stand or tiered stand… or both! Throw in a couple pumpkins and call it a day! A good day! I am a devoted follower of you and have recently started following LoveFeast as well; so it would be absolutely thrilling to win this giveaway! I would use the $$ for some of these pumpkins; my only problem would be deciding which color to choose, they are all so lush! I love the Fuschia colored ones, but this combo you chose is so beautiful, love the Aqua. Love, love, love your blog! Those pumpkins are simply gorgeous!! I would have a hard time deciding what to order but I'm sure I'd find something!!! Headin over to insta to follow Love Feast Shop and on FB too! Thank You!!! Oh Hello! If I had $100.00 to spend at Love Feast Shop I would immediately purchase the snow white trio of velvet pumpkins and I might even use them year round! Think of all of the pretty additions to be displayed with these pumpkins for any holiday from Christmas, to Thanksgiving, Valentines Day, St. Patrick's Day, Easter oh I could go on!! 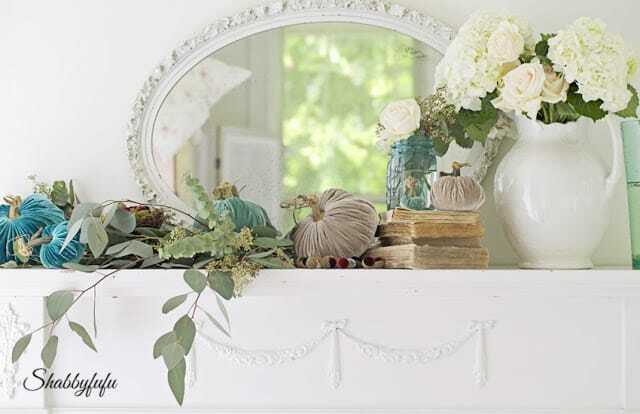 Your mantel design with those gorgeous turquoise and grey pumpkins with the roses is delicious! The addition of the charminf nested velvet acorns is charming! It doesn't get more beautiful than that. What a lovely vignette! Your blog is what dreams are made of……These pumpkins really take the cake! One of my new favorite colors is turquoise and these shimmer like jewels. I love purple too so I would have a hard time deciding which velvet pumpkin set to get. Keep sending me daydreams on your blog. My favorite item in your shop that I daydream of is the blue mason jar chandelier. Simply lovely! Janet, I'm head over heels in love with velvet pumpkins. 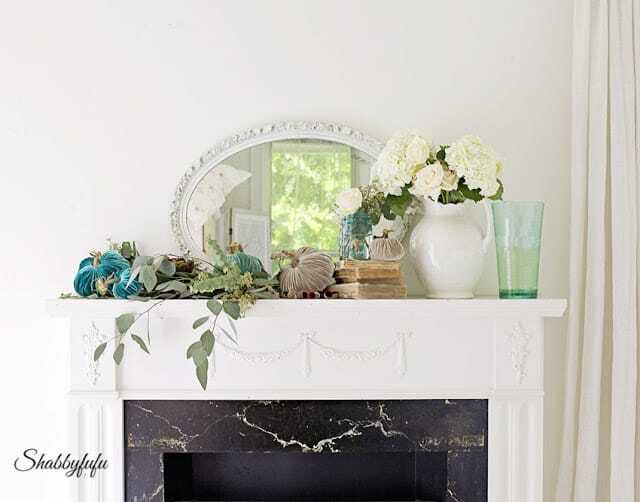 Your mantel vignette is glorious! I've tried to find some fresh eucalyptus, but no luck so far. I love it for fall arrangements. Wow, if I were the lucky one, I'd buy more of these gorgeous pumpkins. I'd spend the $100 if i am the lucky winner on some of these beautiful pumpkins. I am a follower of the Shabbyfufu blog by email and by facebook! Forgot to say, I'm definitely a follower here at Shabbyfufu. I also follow along with Love Feast Shop on both Facebook and Instagram. i am following Love Feast Shop on Facebook! I would love to have a set of those aqua pumpkins in the larger size! Typically I play it safe and choose neutral colors, but if I won, I would be bold and choose the large turquoise pumpkins. They are just beautiful! I adore the Velvet Acorns and the Harvest Trio of Velvet Pumpkins! This is a fall-lovers dream site! Thanks for the giveaway! I'm following Love Feast Shop on FB (Amy Maddux Cooley) and IG (@amymaddux). Thanks for the giveaway! I love these pumpkins! If I win the $100 I might get a throw. Oh my gosh, I just love the way you decorated your mantel. 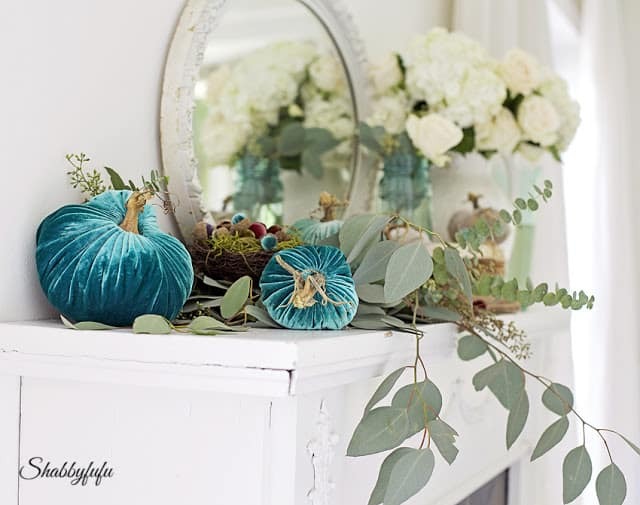 I am so in love with the Turquoise and Lagoon pumpkins. I would pick those. Love your velvet pumpkin colors. I've been following LoveFeast on facebook for awhile and I'm glad their give away bought me to your site. If I won I'd pick the velvet pumpkins! I would spend the $100 on velvet pumpkins! I'd love to buy some of those beautiful velvet pumpkins and probably some Christmas decor! Wish me luck! Turquoise is my favorite color!! Love, love, love the velvet pumpkins! Love the velvet pumpkins! I would spend the money on them! The gorgeous velvet pumpkins would be my choice. Most likely in the turquoise colors of the sea. This is a nice giveaway thanks. I love the pumpkins! I would use the gift card on those! Love your post….Always edifying! Thank you kindly. 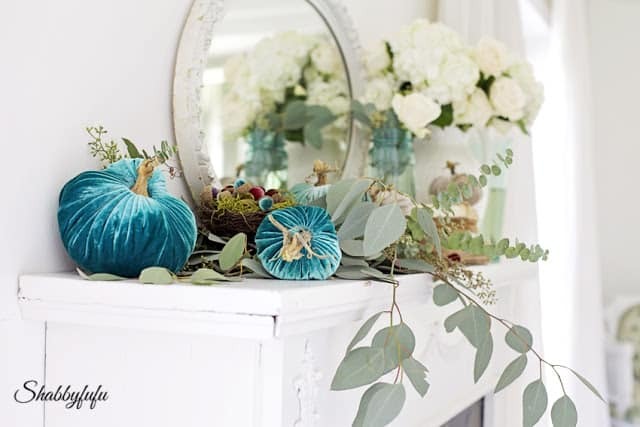 Absolutely LOVE the aqua pumpkins, they would be beautiful in my vignettes for fall. As always your décor is presented so beautifully Janet. Oh my goodness, I need Thanksgiving decor for my home so badly, I don't have anything for Fall and it would be so exciting to win a gift card. The aqua pumpkins are so awesome and unique that I would probably choose them. Thanks so much for this opportunity to win! I signed up for your newsletter and I'm following your blog. Also I'm following Love Feast Shop on FB! I love the set you have. The aqua and the grey pumpkins. I have been getting you in my inbox for a long time. I have one of your throws in white and just love it! I would be grateful to win. Love Romantic Home magazine and your spread in the new issue! I just had to stop by and see your aqua mantel. I adore the colour and have it in my living room. Love those aqua plush pumpkins! Very cute! Thanks for sharing and enjoy your weekend. Oh man, please let me be the lucky follower who wins…what a dream! 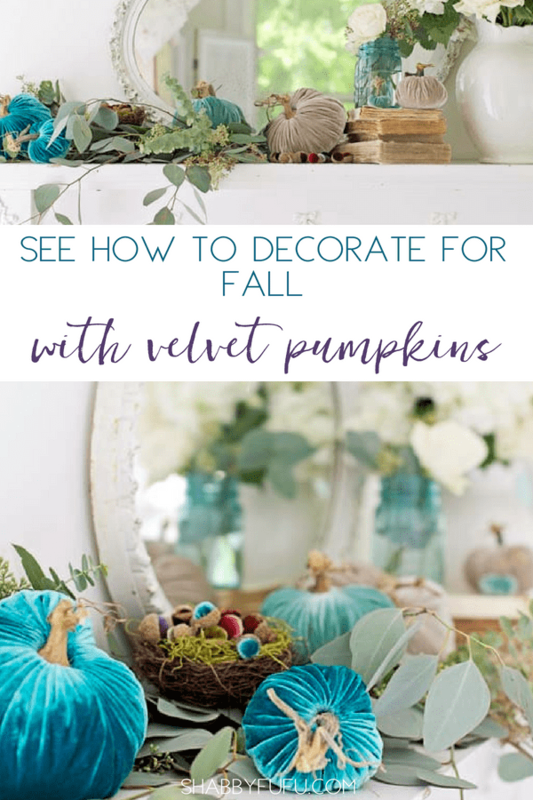 Love the velvet pumpkins and I'd probably go for a hot pink or deep rustic orange. Not sure….but maybe several of the soy Candles! I love candles! Your decor is lovely, as always! If I won the $100 I would use it toward the leather pumpkins gold set. Or the silver set. Probably both! As much as I love the Velvet, and have a few at home, those leather pumpkins are the stuff of dreams! Thank you for hosting another wonderful give away! Hi, I have been a follower of yours for awhile and would love a chance to win a set of the pink pumpkins to share with my little sister ~ she is a 2 yr breast cancer survivor. This would absolutely be a wonderful addition to her milestone celebrations!!! May god bless! I too love the turquoise and taupe combination and Love Feast's pumpkins are beautiful in any color! I have hunter green leather couches from the 90's that I have to work around so I would probably stick with the taupe pumpkins. Your blog inspires me with your neutrals and whites, and the thought of slip covering those green couches is pretty tempting….Thanks , Janet, for all the efforts you put into making life beautiful! I love the NEW Velvet Pumpkin Halloween Large Set w/ Acorns. I love the velvet pumpkins. They are beautiful. I am a recent follower of Shabbyfufu and a devoted follower of Lovefeast, and I know exactly what I would use a $100 gift card for, what else Velvet Pumpkins of course. I absolutely love these pumpkins. They are so lovely. I am a follower of your blog. My sister has always loved velvet pumpkins, but would never spend the money on them. I would absolutely mail them to her if I won. It would make her day…..they are amazingly beautiful. Thanks for the chance and the giveaway! LOVE those pumpkins and that is what I would pick! Thank you so much for the chance to win some. They are gorgeous! I am following Love Feast Shop on facebook also. Have been for some time now. Thank you! Love, love your velvet pumpkins. I would pick the magenta, merlot, and hot pink velvet pumpkins! I follow Love Feast Shop on Facebook.